Before my days as the online influencer and personal style blogger of The Werk! Place, I used to have outfits on reserve for any occasion lined up and ready to go. Not so much, these days. As a regular and consistent shopper, I loathe the idea of scrambling for an outfit at the last minute. I mean, who wants that kind of stress and pressure in their lives? Well, having to create look after look from my own closet has depleted the reserve of looks that I so proudly boasted having pre-blog. I know I can still come out of my closet for the most part but it requires a bit more werk to create something completely new. Well, last weekend, I had another wedding and was all lined up to purchase some new pieces until I remembered this embellished flower dress from ASOS. I’ve literally never worn it and knew it would be perfect for a Spring Wedding. 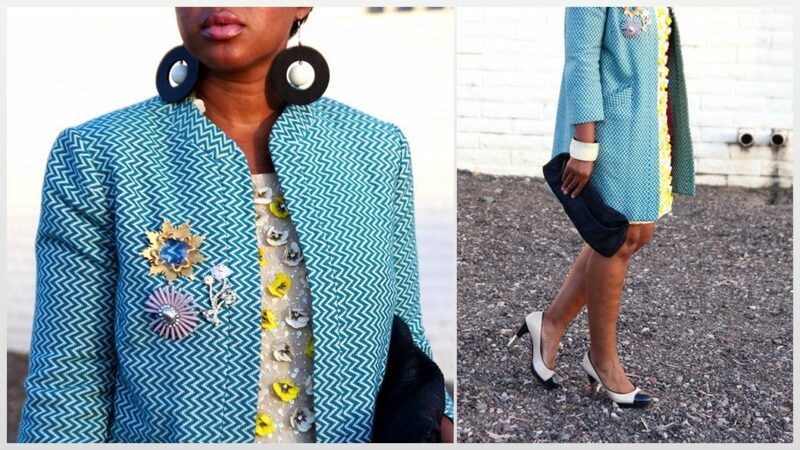 I definitely went for a Sixties vibe by adding the blue three-quarter length chevron coat which I adorned with a little brooch party and the Chanel cap-toe pumps. Winner! Just a simple reminder to shop your closet even when you think there’s nothing there. This is something unique. I just love your coat and dress too. But don't you think that you need to accessorize this dress little more with the collection of designer crystal clutches. You should try it once.